In the spring, in May, England is blanketed in beautiful blooms and that gorgeous, bitter lime green of plants coming back to life. In the summer, for those glorious two weeks, England is lovely, lazy and hazy, but a little humid. In the autumn we have acre upon acre of auburn, golden, crinkly-leaved forests to walk through. Crunch, crunch. The sun, an hour before sunset, low in the sky and lighting up just the tops of the trees. In the winter we have angry clouds and mist that hugs our barren fields. But in April… in April, we got nothin’. Rain and clouds and wind. Sometimes, if we’re lucky, Mother Nature precipitates some sleet or snow (one of my favourite photos, incidentally). But, basically, it’s wet and cold. I love rain as much as the next Brit (which isn’t odd, by the way! I’m sure there are weird people out there that enjoy hot weather too… freaks), but as a photographer, rain really puts a damper on things. It’s OK up close and at high-speed (like this photo), and it’s OK if you’re in some kind of extreme setting — rain dripping off the long, wet fronds of a palm tree, or something — but here in England, in April… it’s just grey. We don’t even get funky cloud formations or really heavy, thick, viscous rain. Grey, dismal-damp wetness. 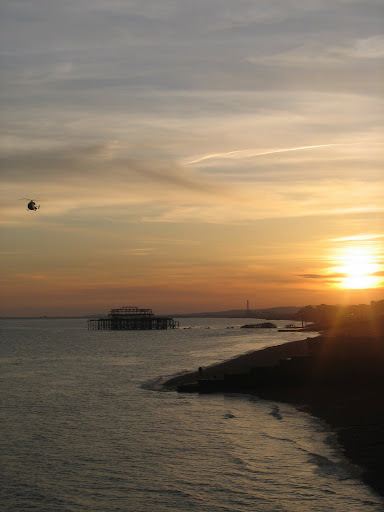 Which brings me neatly onto Brighton, a city on the south coast of England. I was there today, enjoying some fine company and researching a project that I’m working on. It was rainy and windy, but we had fun! Trudging around, plunging in and out of shops to warm and dry ourselves it was a very English experience. The trip wasn’t complete without a trip to the beach and pier, which is where I took these two photos. They’re not exciting, but it’s England in April. I’ll impress you some more in May, hopefully. It’s not obvious, but the guy you can see is performing Tai Chi! I thought it was yoga, but I was corrected quickly… Quite a nice location, though! I don’t even have any words for this one… it’s so… normal. The colour in the water is quite interesting, I guess. And the clouds are almost interesting! Well, I promised you photos, to make up for the awful rehash post I made yesterday. They’re not amazing, but hey… it’s a view of England you might not have seen before…? Oh, I just remembered, that wave you see in the first photo — the wave that is blurry from movement — that wave soaked my left foot, leaving me to squishily my way around town for the next couple of hours. I’ll do anything to get that killer photo, man. Skywatch Friday: The highest point in England Winter falls to the inevitable onslaught of spring Rainy, rainy England. The watery, grey, dismal… gasm. They’re nice photos, and it’s not every day I see a red pebbly beach. If it makes you feel any better, Myrtle Beach is far worse in April. Everything is grey. Awful. I’m sure Fresno is lovely and exciting in April though!! And that’s true, we do stony beaches very well. I’m not sure if that’s a bragging right though… just… a fact. The Irish do ‘em better though. We’re do… mediocre here in England. Temperate. Grey. Weird people who love heat? That’s definitely me! Loving hot weather is normal! I don’t think much of anywhere is nice in April, sadly. This looks far nicer than Ottawa right now, where the grass is all flattened by the five feet of snow that were on top of it until like two weeks ago. Very funny text to accompany your post. So glad to have stumbled on this post. “there are weird people out there that enjoy hot weather too… freaks” – I would be one of those freaks. I’m not happy unless it’s at the very least 85. I hate the cold and the rain (unless I’m inside and being kept warm). why is the beach red? are those rocks? or weird sand? I like the rain… the sound of it, the way it makes things smell, the way it can transform any setting, or at least… reinterpret it. I’m one of those people who has sort of a strange relationship with water though… like in Big Fish! Fresno is indeed quite lovely right now. The best time to be in Fresno are during the Spring and Fall months (even if the weather is all about not being able to make it’s mind on hot or cold). I certainly prefer warm to hot over cold any day. Jackets and coats and hats are fun, but I’m afraid until I’ve got a cute boy to snuggle with I don’t think I’ll ever be keen. Isn’t Ireland known for being pretty overall? Maybe that’s why the English don’t like the Irish so much… they hate that the Irish are so much more pretty than they are. oh but i like overcast skies. they’re pretty. Well akshully…… I think Engand is pretty fine in April. I was driving around the other day admiring the woods with daffodils, and the magnolia trees heavy with pale pink blooms, and the camelias with massive amounts of flowers on varying from white to deepest red…. and the trees are just coming in to leaf too. Maybe it is just Brighton. Brighton in bad weather is worse than most other places! i like this pair, combine them and the sea reduces to a river. very nice color on the beach, fits well together with the colors of the sea and the skies. nice perspective also. weather is bit offputting thou. happy SWF! I actually like them, I do miss the rain and home…. I much prefer Brighton in the summer though, do you mind if you share mine? Actually….those pictures were taken in April! So it can be nice. Ner. Jo, I think we both agree that April is lovely, with regard to bluebells and snowdrops and the last few dying days of daffodils… but it’s nothing compared to May, or March when the bulbs come up, but you still have some chance of clear, winter skies. To all the cold naysayers: I was just winding you up…! But I was more trying to point out how irrational your hate of the cold is. Clever, eh, eh? I love the warmth as much as the next person (well, the sun, not the warmth… stickiness is nasty). Have you really never seen a red, rocky/pebbly beach, Hannah? No need to ‘ner’ me, Pink… I’ve lived here for 24 years, I know what the weather can be like, and how weird and interchangeable it can be! April can be 25C, or it can snow (like the photo I linked!) But more often than not… it rains. I wouldn’t mind if it was proper, heavy rain, but it’s not even that! And damn straight you should miss home. Rule Britannia. I really like your web page!! I enjoy nature pics. Thank you for your comment on my guest host for sky watch photo they accidently used my husbands name but I am Megan and it is my photo my blog is happy heifer. Anyways you said you always wonder what was cropped out of a picture. That particular one I cropped out part of a fence and horse corrals it was just the top of them and it was dark so they were not that recognizable mostly I just cropped off some darkness from the bottom of it. I was in such a hurry to capture it did not want to miss it!! Thank you and have a wonderful day. Whoa. I’ve never seen a red beach before. That’s really pretty. and at least you have an ocean somewhat near you. Let’s think…. I have to travel halfway across the country. And my country is just a smidge larger than yours. But I have to admit, April, May and June make it worth living here the other nine months of the year. Just….. *sigh* wonderful. Hey Megan, thanks for coming by to clarify I had a brief look at your blog, and that first photo of the flower is quite stunning! I normally try to bring up the dark bits in photos, if they can be made interesting, but I like huge photos with lots of cool ‘features’. Though, for Skywatch, I guess it’s mostly about the sky…! The rocks on that beach aren’t actually THAT red by the way, but they’re very wet, so that exaggerates it a lot. The white balance is probably a little off too, which makes them a little more yellowish. Cari, central America must be… an interesting experience. The furthest I’ve been is Atlanta, and that’s hardly central. I’ve seen some maps, and the population density is certainly very low around those parts… but I guess someone has to live there! And you have the Black Hills of Dakota… which Calamity Jane insists are beautiful…! What’s so special about Dakota in Spring/Early Summer? i laughed at those ireland vs england comment. living here in dublin for a number of years does teach me something. to see things from an asian POV… well, i better not say anything. i love england. i love scotland. i love ireland. i think it’s time to forget all the friendly rivalry between any country at all. grow up people! Yeah, anything we get here in England, Scotland and Ireland get worse. Well, except for the heat — I don’t think Ireland or Scotland have EVER had a heatwave. I can only imagine what the rain is like in Ireland, sitting there, exposed to the Atlantic. I’ve still never been… I hope to go this year though! You can come to England, and I’ll go to Ireland… and we can compare notes! Good God man, where *are* you? Weather’s been beautiful round here. But yes, I was out and about today, driving along some lovely country roads and it was beautiful, all green and lush. I’ve never, ever been in Brighton and had good weather. Unless you magically live on the Pembrokeshire coastline, Jen, EVERYWHERE else in the UK is considered ‘rainy’. It’s just a fact of life here on our lovely, green… rainy island. Wake up and smell the drizzle! hm only an hour away? London has moved up on my “places to go” list. I’ve never seen that, is that a coral by the sea or something? So, no sand? Hehe, no… just rocks. Pebbles. We do have sandy beaches! We just have more rocky ones.